Koi Kahe Keheta Rahe,kitna bhi humko Diwaana.............hai yeh Zamana! Its been a long time for now that I did a trekking expedition. Last time it was in the Matheran hills with Jitu and Ajit, in Maharastra , which is the second time after the 2005 matheran trek by MediaOne guys. in was a small , you could say the tini trekking । Throughout the world , the master of all the trekking is the lovliest and stunning beauty of the Himalayan Mountain ranges. 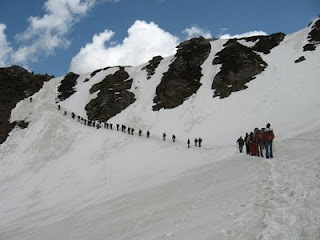 Yes this time I am going for it , a Trek to the height of 14000 ft above sea level, through the Snow clad mountain peaks of Himalayas. Its been very long years that I am going backto my favorite Childhood place, were I had my Schooling before my Fathers Retirement. 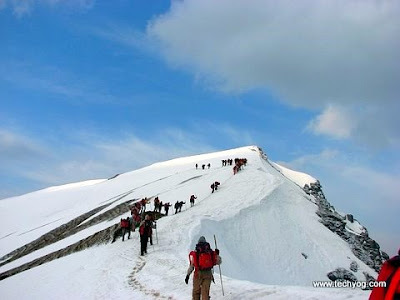 Will be heading to Delhi on the 29th, Will meet 5 friends there (hope to see all you Ravi, Nikhil, Jayan, Idris and Sarver), than to head for the ultimate cold of Himalayas. here comes the hindi Song beezing for Himalayan mountain, while writing ....Hmmmmmm जब छाए मेरा जादू... कोई बाच न पाई "
Really looking forward to visit my childhood place, the Yol Cant near Kangra valley in Himachal, just the scedule of time needed..
Only 6 days left for me to leave Cuttack, and my backpack is getting bigger with each item I pack.